I’m trying to find a house or retreat center that will accommodate our small family reunion. I’m not sure on the exact head count, but it will probably be between 15 and 25 people. My husband uses a manual wheelchair and his mother uses a walker, so we need a wheelchair-accessible place. The location isn’t horribly important, because we just want a place where we can visit and cook, but we all live on the east coast. Do you have any suggestions for me? 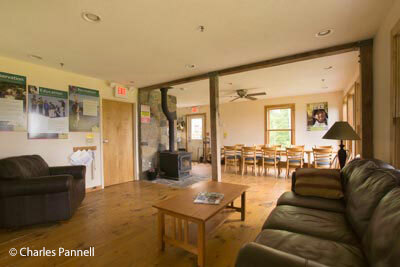 Operated by the Appalachian Mountain Club, Noble View Outdoor Center (413-572-4501, www.nobleviewoutdoorcenter.org) is the perfect reunion venue for you. It’s located on 358 acres of land that overlooks the Connecticut Valley, just six miles west of Westfield, Massachusetts. And although the historic lodges were built in the early 1900s, the Appalachian Mountain Club has made access upgrades over the years, so they now work for wheelchair-users and slow walkers. 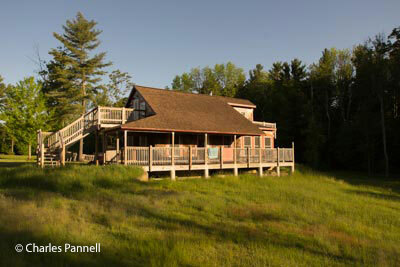 North Cottage is the smaller of the two lodges, and it can sleep up to 10 people. There’s level access from the deck into the large great room which is furnished with two sofas, a love seat and an easy chair. There’s a large table with chairs in the dining area, and the commercial kitchen is equipped with a stove and a refrigerator and a good selection of pots, pans, dishes and utensils. There’s good pathway access throughout the great room, and for added comfort there’s also a wood stove to heat the cabin. The accessible bedroom is located just off the great room. It’s furnished with two 17-inch high twin beds. The second bed can be taken out to provide a full five-foot turning radius if needed. The other bedrooms are located upstairs. Double Cottage is located next door, and it has the same basic layout, except that it has two wings between a double commercial kitchen. 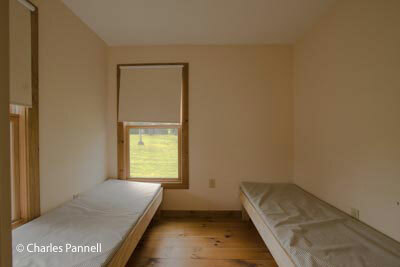 It can accommodate up to 18 people, and it has an accessible bedroom in each wing. The accessible bathhouse, which is located behind North Cottage, contains a unisex accessible shower room. 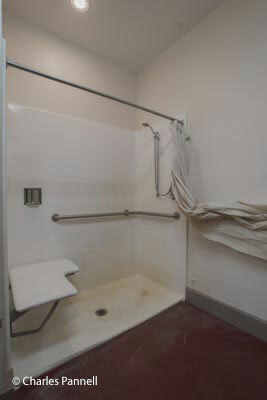 It’s equipped with a very nice roll-in shower with a fold-down shower seat, a hand-held shower head and grab bars. 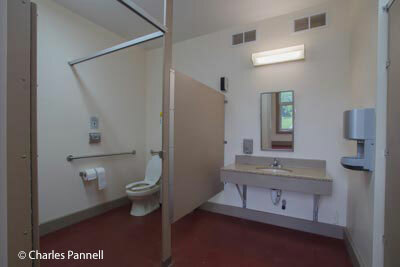 An accessible toilet with grab bars on the right and back walls (as seated) is located at one end of the room, and there is a large roll-under sink in the middle. Best of all there’s plenty of floor space, and the room can easily accommodate large wheelchairs and scooters. It would also have plenty of room for your mother-in-law’s walker. All in all the access is very nicely done. The lodges are relatively affordable too. 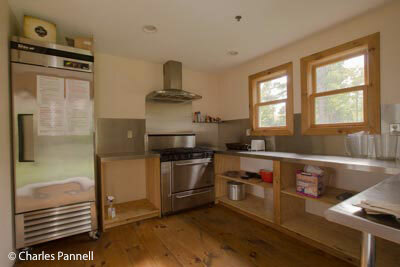 North Cottage rents for $295 per night and Double Cottage rents for $515 per night. An although that seems like a lot, when you do the math it’s actually less than $30 per person, and that’s a price that’s hard to beat. The front deck is also very large, and there’s a nice grassy area in front of the cottages if you’d like to serve some meals al fresco. And since you’re not sure about the number of attendees, you can rent Double Cottage if you only have 15 people and then add North Cottage if you have 25 people. Keep in mind that you have to pack out all of your trash, but that’s the price you pay for the off-the-beaten-path location. You also need to bring along bedding and towels, but again it’s a rustic lodge, not the Ritz Carlton. Truthfully, Noble View Outdoor Center has everything you really need for a relaxed, secluded and very accessible family retreat.